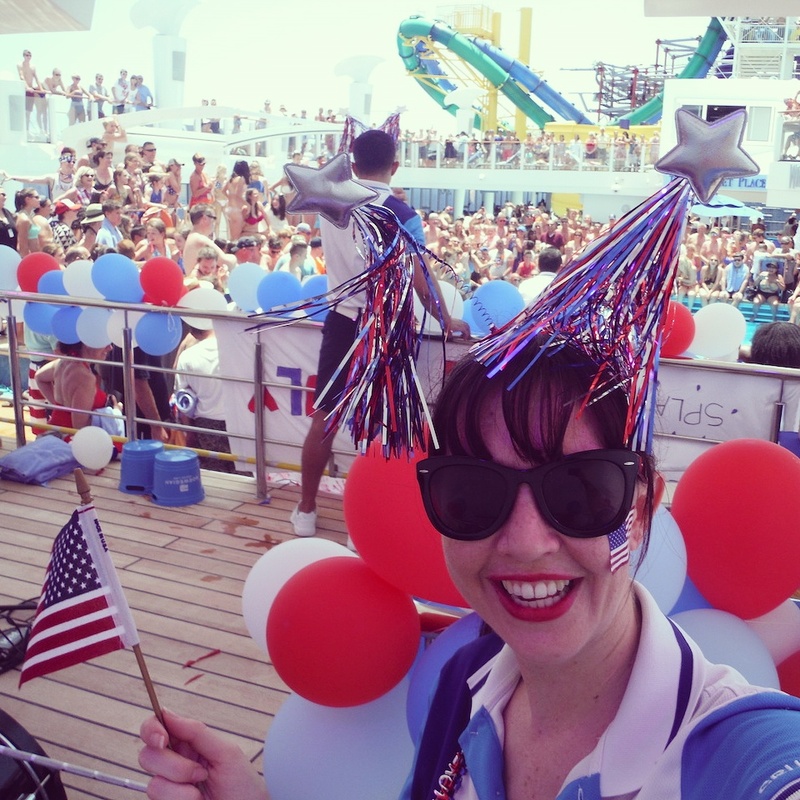 Lately we’ve celebrated quite a few national holidays …Well, the crew has anyway. The guests have celebrated just one. Yes, the fourth of July was two weeks ago. In preparation for it we had a meeting to discuss how we would entertain our mostly American 5000+ guests that day. Everything had to be American themed! My British supervisor offered to run around the ship with a bell shouting “The British are coming, the British are coming”. Our American Cruise Director was not too keen on the idea. Everything for the rest of the day was extra American from the trivia to bingo, scavenger hunts to origami… - Okay, not origami. I did suggest that we fold butterflies and just tell the guests that they were eagles, but no one went for that idea either. Then there was the big screen movie for the day: Captain America. The highlight of the festivities was a Fourth of July poolside carnival. We started with a pool olympics complete with patriotic-sounding team names. Then we had our own personal resident Tony-nominated broadway star sing the national anthem acapella (as one does). A hotdog eating contest was next on the schedule because being the person who can shove the most processed meat and carbs down one’s gullet is apparently a much coveted title in this nation. Then if that didn’t quite satisfy the guests, for dessert I cohosted a pie-eating contest, where we had parent and child pairs competing against each other. No utensils were used, but contestants had to eat with their faces. And when no one even threw up, we finished it off with some country line dancing - Yeehaw! That night of the cruise we usually have our Latin party but considering certain politicians want to build walls to keep certain Latin nations out of America, we decided to celebrate some more American aspects of American culture and swopped it with our 80s party, calling it an ‘Awesome American 80s party’. And then instead of Latin music we played mostly British stuff. It was a long day but the guests loved it. I’m pretty sure I’ve earned a green card by now. - Although, I might have lost it with that comment about the hotdog eating contest. Yeah, I don’t know what the Canadians did all day. “Canada day” was three days before. We had a Canadian themed trivia for that one …and that’s about it. In June, there were more celebrations. The crew enrichment people decided not to throw us a monthly crew party but rather to just throw the Filipinos an Independence Day party and invite the rest of us. There were some sentimental videos and a lot of karaoke. - The Japanese may have invented it but the Filipinos have taken it to a whole new level. It was a fun party but I was very dissatisfied with the absence of Ensaimada bread which is pretty much my favourite part of Filipino culture. I got a bit more excited about Colombian Independence day today (but we celebrated it last night). - Any excuse to salsa! I maintain that I am an honorary Latina even if my supervisor says I’m as Latin as Jane Austin. Whatever. My hips don’t lie. And I’ll prove it as soon as I take off this corset! After trying to go there once before with Veli, I managed to get there with some of my other friends. This time we just took a taxi straight there and spent all our time there so it was fun but there wasn't much to blog about. 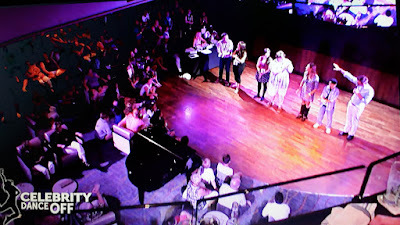 I made it into the finals of the Celebrity Dance Off two weeks in a row! What started off as a fluke turned into a two week fluke! This time my partner was not as hot as Sebastian but the clothes still started to come off. Then last week I was eliminated first as usual and hosted my usual late night karaoke session in shame. Equilibrium has been restored to the universe. 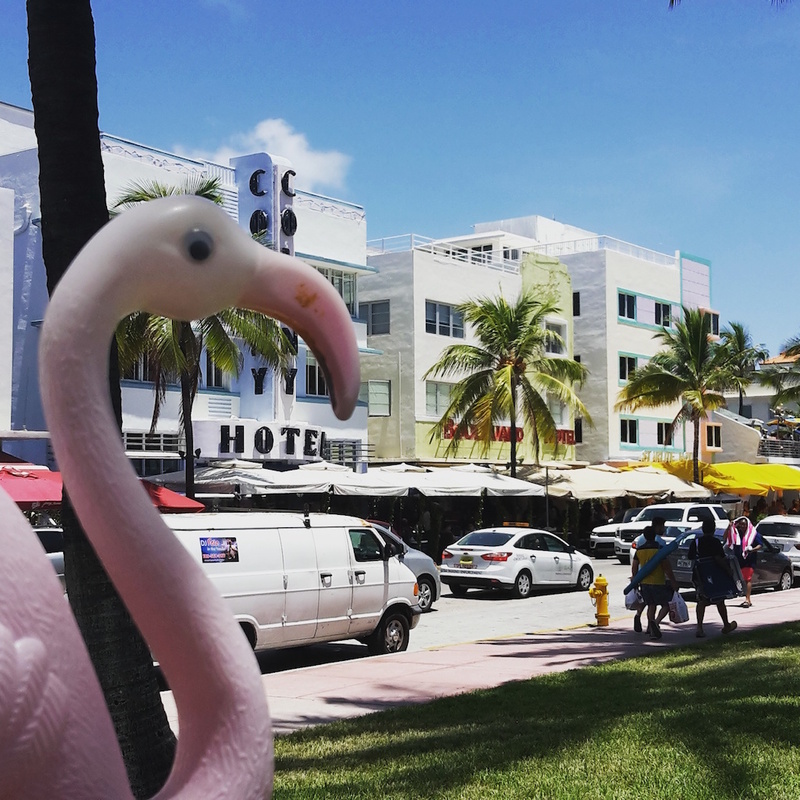 So the day that I met the Rodrigo who inspired the trip to the Target where I found my Rodrigo (the pink plastic one) (If you have no idea what I am talking about read the What’s with the flamingo? tab) he was trying to teach me how to dive under the water without accidentally inhaling water through my snorkel and choking to death while trying to find Nemo. While working for my previous company I ended up with my own snorkel mask from a shop affectionately known as “L&F” (as in “Lost & Found”) but never succeeded in getting that whole diving and not drowning thing right. Then last week, the snorkel set that I ordered online arrived (after the last one died on my last ship), and with a little help from a friend (thank you) I was finally able to get it right. Yay! - And it only took six years! It’s true. After five months there’s finally two of us. Actually our Assistant Cruise Director is signing off this week (I will miss you) and his replacement is a lady too. We’re taking over! I quite love Paradise island by Nassau but we usually have such little time off in port (three hours) to change, take a taxi there, swim, come back, shower and be back at work, that most of the time it becomes a nap day. Recently though, I forwent the nap and went to the beach and took underwater selfies with my friends. The water was really clear but it was also very salty and I didn’t have my snorkel yet so I had no idea how clear it was until I saw the pictures later. 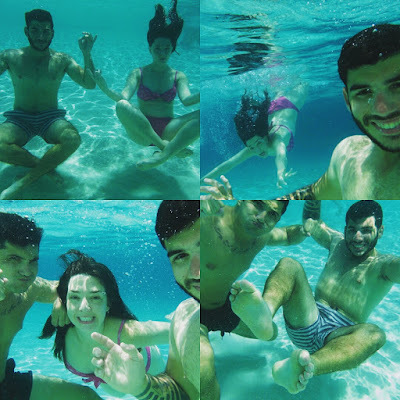 My underwater selfie taking abilities are definitely improving. Now if I can just find another turtle!